200mm SCT, f/10, 25mm, eyepiece, 81x, binoviewer, light pollution filter. On April 2nd, 2011 I spent an hour observing this magnificent Messier object. I have produced the sketch using graphite pencils and blenders on white paper, scanned and inverted the digital image using GIMP. 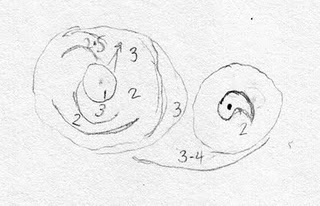 It is based on the intensity sketch shown below drawn at the eyepiece under averted vision. 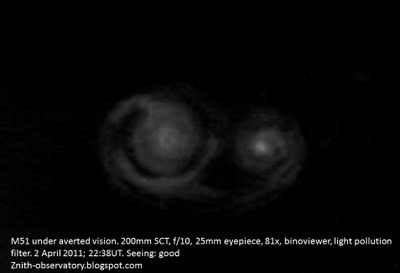 I wanted to portray the ‘ghostly’ appearence of the two galaxies to mimic the actual eyepiece view. Most of the observing time was spent detecting under averted vision the very faint streak that connects the two galaxies as well as the spiral arms. The sketch looks very nice. To my eyes the nuclei of the pair has always looked pretty even but now I’ll need to see if I can detect a difference in brightness between the centers. That’s impressive, man. It must have been a great night.